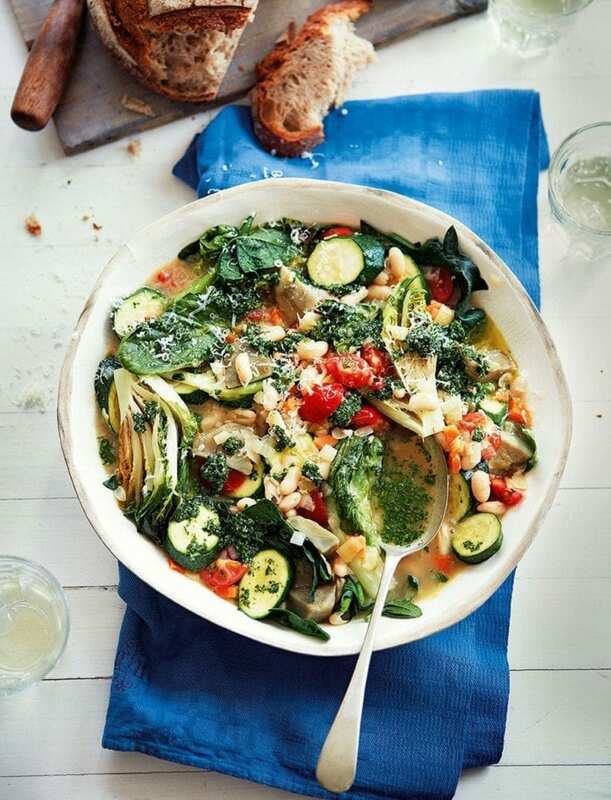 Wonderful summer vegetables, herby pesto and cannellini beans come together to make this speedy light supper. To make the pesto, chop the parsley very finely, then put in a medium mixing bowl and stir through the olive oil, lemon zest and juice and 50g grated parmesan. Season to taste, then set aside. For the stew, heat the butter in a large casserole or sauté pan over a low-medium heat. When it starts to foam, add the onion, leek, carrots and garlic. Cook gently for 10 minutes or until the vegetables are soft but not coloured. Pour in the white wine, turn up the heat and bubble for a few minutes until almost completely reduced. Add the artichokes to the stew along with the stock. Bring to the boil, then reduce to a simmer and bubble gently for 15 minutes, adding the cannellini beans and courgettes after 10 minutes. Add the little gems and spring onions to the pan, cook for 3 minutes, then stir in the spinach and cherry tomatoes. Turn up the heat and bubble briskly for 1 minute to wilt the spinach, then taste and season well. Spoon into warm bowls, then drizzle over the pesto and top with extra grated parmesan, if you like.